If an old neighborhood is changing we are quick to label it as part of the ‘gentrification’ and turn our backs. But sometimes that change is not reshaping the face of a neighborhood with generic food chains or overpriced investor architecture. Sometimes we are just witnessing that a quarter is BECOMING something….exciting. Like the “Neustadt”, this quirky little place between the inner-city, the Michel and the Karoviertel. Now, the Neustadt still feels original with its dark corner bars, old craftsmen shops and the inevitable discounter. But a growing number of interesting little shops, diners and bars are calling the Neustadt their home. And it just works! The neighborhood has just become one of the most exciting places to shop, lunch or just hang out – and it still feels authentic. Exemplary to that observation is the PERLE STORE. 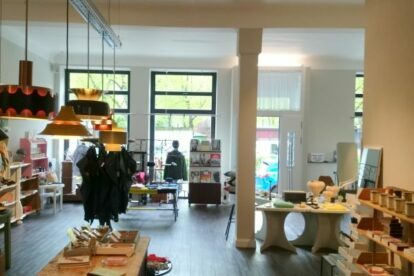 This beautiful shop is situated right at the heart of it, the Grossneumarkt. And it is filled with all sorts of treasures that you just want to take home. They have a small but super-exclusive collection of clothes for women, men and kids (A.P.C., Maison Kitsuné, Norse Project). You can listen to and shop for records by the German Electro label KOMPAKT or browse the stack of cool books and magazines. Also, PERLE offers a tremendous variety of home accessories.